Which brings us to this week’s drink which, I promise, is completely legal in all 50 states. It is, however, an edgy homage to one of the more popular (and more drinkable) beverages of the 1970s and 80s in which the late Ms. Fisher would have done most of her wishful drinking. It’s a Tequila Sunrise that dares to bring us to the edge of a (fairly safe) precipice. I thought it would be interesting to add the gut-punch digestif Fernet Branca and the anise/bitter propulsive, absinthe, the only booze I know of which was banned for roughly 95 years. Combine the liquid ingredients in a cocktail shaker with plenty of ice and shake as if you’re not sure where you’re going to wake up the next morning or who you might be looking at when you do. Strain into a chilled cocktail glass, add the cherry, and contemplate the cold reality that booze (and other chemicals) can take the edge off in a very special way, but it can’t really cure what ails you. The only booze that I had more than one brand of for A Postcard from the Edge was tequila…and boy, do I have a lot of tequila here courtesy of the my friends in the booze biz. (I only wish amaros, brandies, and expensive liqueurs were marketed so aggressively.) I think I had the best luck with Case Noble Tequila Blanco, which had the smoothest flavor but enough agave punch to stand up against the other ingredients. However, those who want an ever stronger tequila kick might prefer Sauza 100% Blue Agave. On the other hand, Hornitos Plata was just dandy. Overall, I liked this particular creation quite a bit. 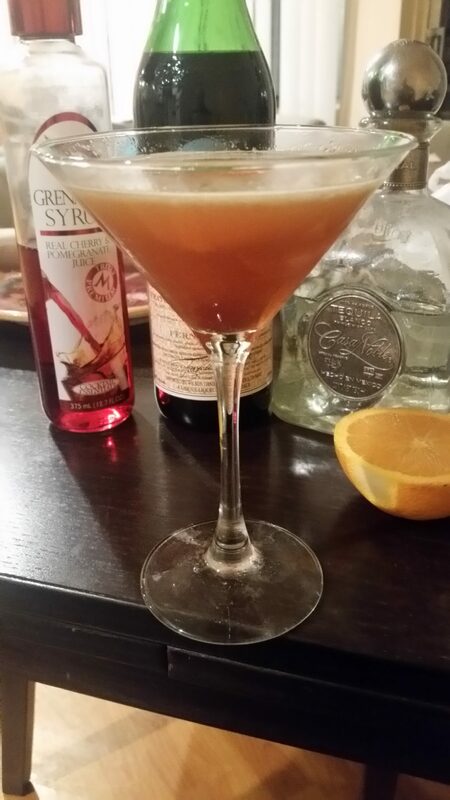 The bitter and herbal flavors of the Fernet play nicely on my tastebuds with the tequila and the sweetness of the OJ and grenadine. However, my in-house guinea pig begged to differ and really didn’t care much for this one, finding it a bit harsh. This drink might be a little bit too much on the edge for some, but that’s showbiz.